I brought this for my husband and he was impress with it being personalized and quality! 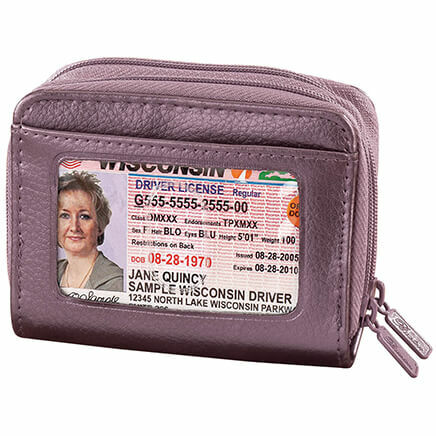 The Wallet is great it is just what I needed to carry my credit cads and ID plus many more items. for everyday use. Fits great in my purse. i purchased this item for my mom and she loves it.. she talks about so much i might buy one for me.. This is by far the best wallet I have ever used. 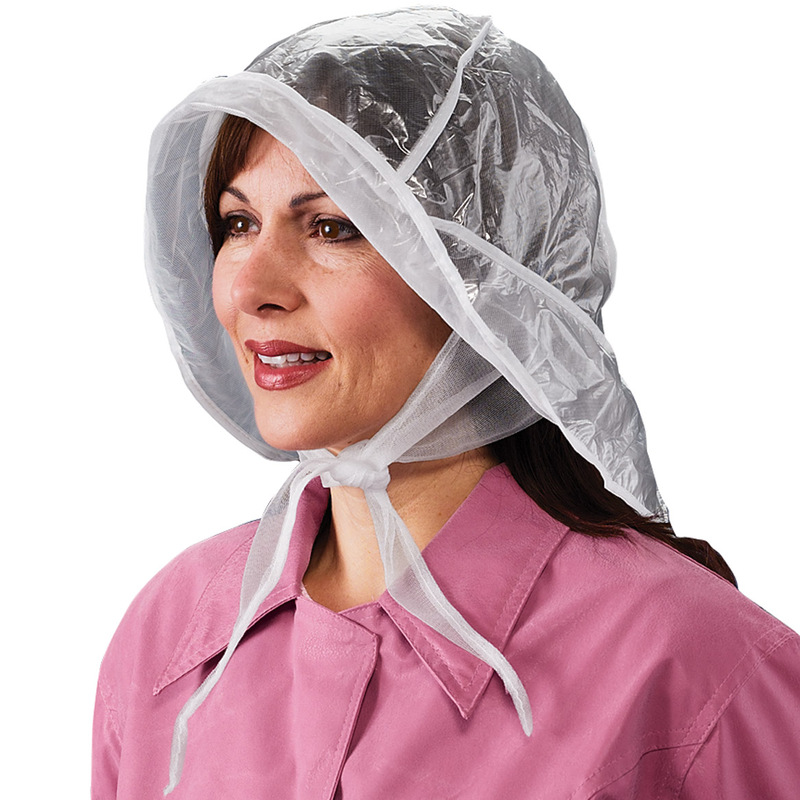 I have ordered these for several years now for myself and for gifts. My friends love them because they zip up and they fit in pockets so that when shopping (especially antiques) you don't have to carry a purse. My brother saw this in the Walter Drake Catalog and wanted it. Pleased with the selection. Accurate in description, durable, and slim enough to carry in his back pocket but big enough to hold what he needs to. Have bought this item before and ordered two this time for gifts for my husband and son. They love the security of not losing anything. The zippers are great. Best travel wallet I have ever had. This small wallet zips up and fits the pocket of my blue jeans. I really love it for shopping in antique stores or anywhere I don't want to carry a big purse. I have purchased some for friends and family, too. Zippered wallet makes it nice and the change pouch is a added vale! Just what my wife wanted. Good price. I prefer a wallet with coin purse & this has a zipper & identifying initials for a definite plus for security & style. My husband likes leather wallets and one with a zipper. We can not find them in stores, when I found this one he said order it and he was surprised that it came so quick. It was just what he wanted. I'm a mechanic.This wallet keeps items protected from sand,etc. At first glance you might not be sure if its a quality product,but it is.The only glitch was when ordering online you are compelled to purchase it with initials.In the catalog you can get it plain black.I would definitely recommend this product. I had one of these wallets years ago and have been looking for another for a long time. My old one wore out. I love the size because it fits into my jeans pocket. Wonderful for antique shopping and in malls because I don't have to hold it or take my purse. My oldest son absolutely loves this wallet. I bought his first one several years ago when he was in his mid twenties, and it quickly became his all-time favorite wallet. After a couple of years of constant use, it started to look worse for wear so I replace it with a new one. This pattern has continued over the years. My most recent purchase was the fourth wallet I've purchased for him, and it's still one of his favorite gifts/possessions. He loves that it zips up and that it is monogrammed. Has even survived the Washer & Dryer! Has survived over 6 years of daily use, often soaked by rain - or sweat! Plus has survived at least 4 accidental trips through the washer, and a couple times through the electric dryer... Decided to get a new one, looked at lots of wallets - then decided to see if Walter Drake was still in business... Happy to find that they are, and I believe that this is even pretty much the same price I paid years ago! Even my initials are still clear - and the zipper still works - although I do tend to stuff so much stuff into mine that I usually can't zip it. AMAZING Value! Honey - Where's my Wallet? Have purchased two of these before. They stand up to wear as well as the more expensive "brand name " wallets. I like the "zip around" feature which prevents any of contents from escaping. Good value ! . Perfect Christmas gifts for those hard-to-buy for men, teenagers, and boys. A reasonable price and a good looking gift. Keep all my credit cards. ID's and favorite pics. The best thing is the zipper. Never have to worry about losing any items. Things falling out with wallet zippered. This product is used everyday. He loves it and liked it as a gift. It is holding up to what it is needed for. I had a very hard time trying to find a wallet for my father this christmas. He only wants wallets that zip all the way around and they where very hard for me to find. After three hours online and several hours going from store to store I found this wallet and it was even better since I could get his initials added on this one to make it more personal of a gift. fall out of the wallet if dropped. I'm very happy with this wallet and have no complaints. Love the zip around and the gold initials. Every thing is great on it .I have the same thing that I bought a few years ago and I been looking for a new one as mine is getting old and starting to come apart . The only thing I wish the change part was a zipper instead of a snap. I paid attention when I purchased the product so that the person I was buying this would get the most use from it. love the look. Initials add flair. The zipper closure is a plus. I discovered that I like slots for my cards, not the plastic sleeve envelopes. Everything else was good. It costs too much to return it - so it will be used as a white elephant gift. I had one of these for about 4 years before I decided to buy a replacement and a spare. 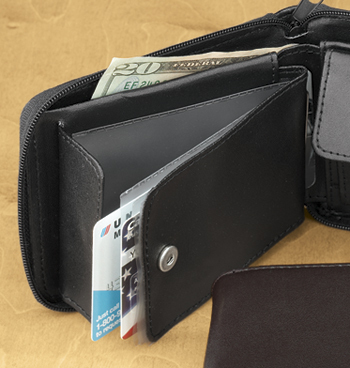 There are lots of compartments but the zipper feature limits how much you can put into the wallet and still zip it. The zipper on mine failed after about a year because because of the bulk of the credit, gift, insurance, business, etc. cards that I care. 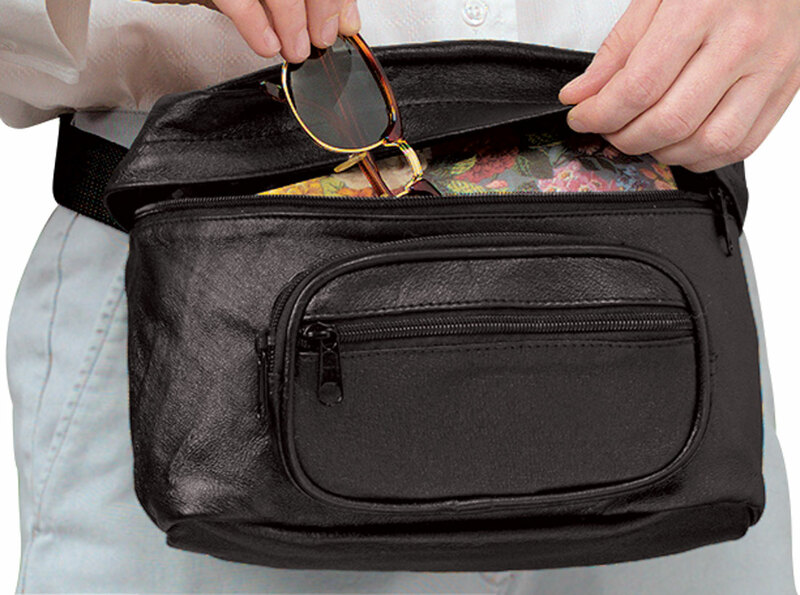 The coin purse and photo/credit card compartments have snaps for additional security. I purchased this for my son, who requested a zipper wallet....I have purchase them in the past, and this is just a replacement. However with everyday use the last wallet lasted almost 2 years...I really do not know how long this one will last. It is suppose to be one of his Christmas presents, so he has not used it yet. This is my second purchase in a year of this wallet. The first was very supple to the touch...this 2nd is very stiff and not nearly as soft as the first. It holds a lot of things one needs in a wallet. The zipper is very good. I overstuffed my 1st one and the zipper broke...my fault. Disappointed. This was to be a gift for a family member. I have looked at this item in W. Drake catalogs many times and thought about ordering it for a family member who would like a new wallet. Many people rate it highly, so I ordered it. BUT I am very disappointed at the quality of the wallet I received. The one I received is DEFECTIVE, as follows below, and I should receive a refund (even though it is personalized). I CANNOT offer such a gift to the person for whom I intended it. Why? 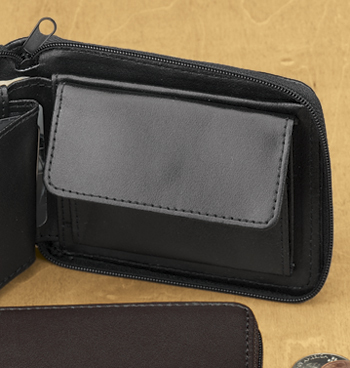 Because of the appearance of the wallet on the inside. The stitching of the inside coin holder is not at all well done. The fold-over top is skewed to the right, making the right side angle downward and the right side of the flap look longer than the left side. The left side of the flap angles upward and looks, of course, shorter than the right .... definitely not as pictured online. Second, and of lesser importance, the PCV card pockets look a bit shoddy ... heavily wrinkled, with one even folded over on itself. However, the large wrinkles may well "disappear" when credit cards are inserted. On the positive side, the zipper works very well. 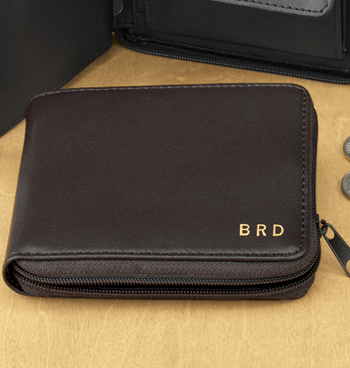 and the lettering of initials is beautifully done, and the credit card pockets are large enough for a standard credit card. But I still cannot give this as a gift, because of the defective inside coin pocket. At this price, I would not buy it at a store, even for myself. I guess other buyers have not had this problem, or maybe some do not mind the look of what they received. Looks really cheap- Dollar Tree cheap ! This product looked nice in catalog but when I received them I was shocked at how cheap they looked. They look like they will tear up easily and color brown is lighter than a regular brown. The lettering made them look even worse. If I had not had them with initials, I would have given them to children for Christmas instead of adults. Seriously think I was smart to go buy them another gift. This is the first time the product was a real disappointment from your company. You should have your buyers inspect more than the sample item before adding to your inventory for the name sake of the Walter Drake product quality that is expected !!! I have bought this type of wallet before, but I don't remember it having this strong odor. Since the monogramed one can't be returned, I tried to remove the odor with vinegar, Pledge and a leather wipe. It smelled okay for 5 minutes, then reverted to the bad odor. I ordered a cell phone holder awhile back (don't remember which catalog) and it too smelled like this. Won't be getting any "leather" items ever again. Gift for husband who wanted a zip around wallet. 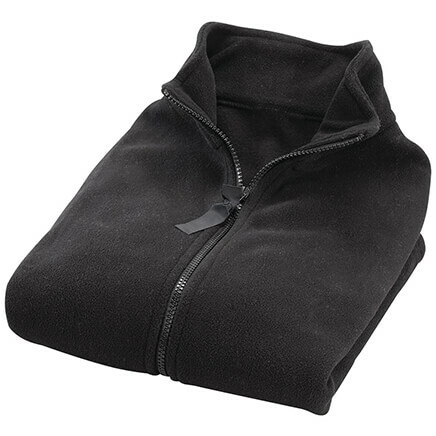 This is handsome enough, but the problem is with the zipper, which is stiff and hard to zip. But worst of all is after putting in your documents and money the wallet will not zip around as the wallet does not close tight enough with documents. So , if if wasn't monogrammed I would return it. Miles Kimball's employees should have tested the zipper first--to ensure the zipper opened--before mailing this wallet out to customers! From the outside, it appeared to be a nice leather wallet, but I couldn't open up the zipper to see what the wallet was like on the inside! They are exactly what I have been looking for. This is for a friend. I bought my husband one many years ago and it is still being used. Very nice wallet. I purchased before and love it for my husband. He is a roofer and this wallet holds up!! I THINK MY SON WILL LIKE THIS FOR HIS BIRTHDAY FEB 1. HIS OTHER WALLET IS OPEN. The zip up feature caught my eye. It will keep your items from falling out for sure. I really like the looks of this wallet. My son wanted a zippered wallet, I thought the personalization was a nice touch, good price too! need to replace one like it that only lasted 2 years. My husband's favorite kind of wallet. Have ordered this before and my husband loves it. My father was looking for a zip wallet. We are so happy we found it here. This is for my friend's birthday. He mentioned that he needed a wallet. I think the personalization will be a nice surprise, along with the fact that it is leather and should last longer. I wanted a first wallet for my 14 yr. old grandson that was zippered, compact, had a coin purse inside it, and I could have his initials inscribed on the outside of it. This is exactly what I was looking for and could not find anyplace else. I hope it is a quality made wallet that holds up! I chose it for my husband so nothing will fall out of his wallet! I have been using zipper wallets for years and love them for that very reason! Thanks and Merry Christmas! It is simular to the wallet I bought for my husband and his wallet does not zip any longer. Replacement for same item. Good value ! 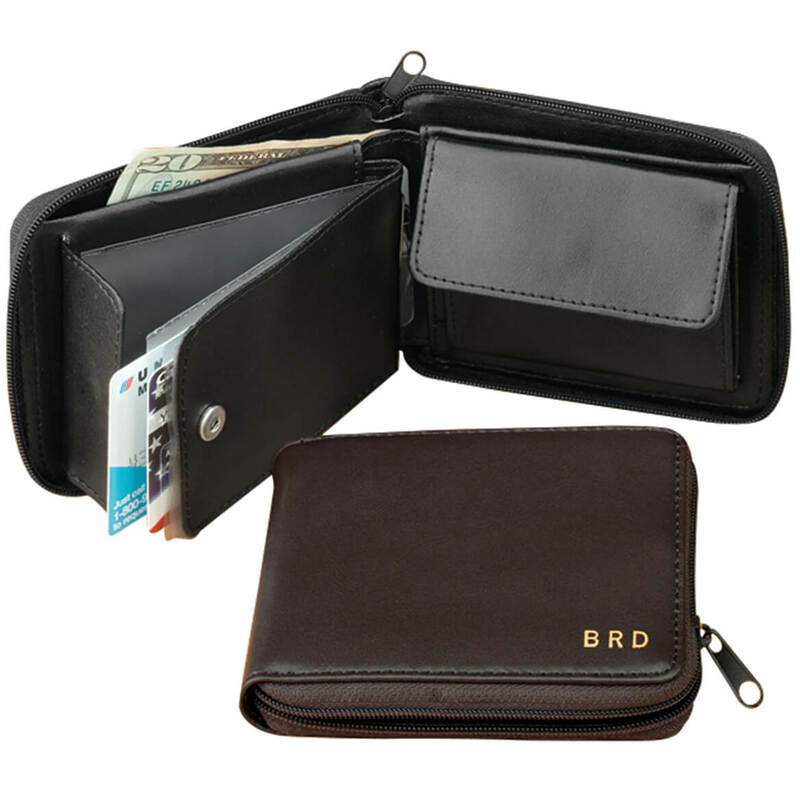 I CHOSE THIS ITEM, BECAUSE IT KEEPS THE MONEY SECURE, I LIKE THAT YOU CAN PERSONALIZE THE WALLET. Just what my Uncle wanted. 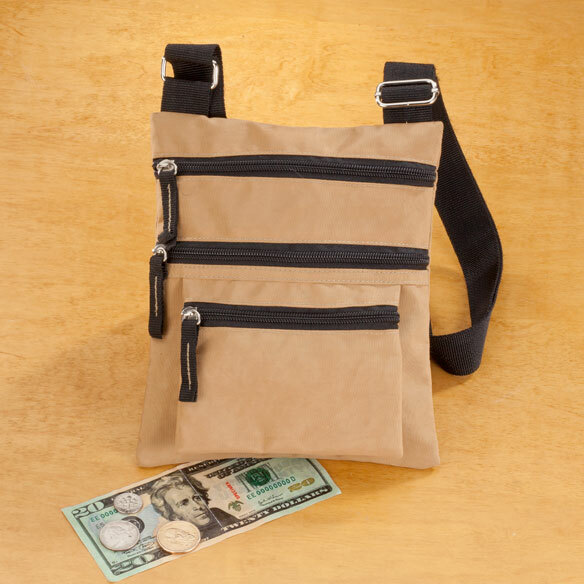 He really likes this billfold, it has a place for his coins and paper money. and it zips all around. I purchased this wallet for my son who is graduating from 8th grade. I liked the option of having it personalized and that it had a zipper to keep the contents secure. He'll be going to theme parks a lot this summer so I know this will be a great feature he'll appreciate.